How do some people become so extremely wealthy? The mere thought of great wealth brings a gleam into the eyes of every one of us. Everyone wants it but few are blessed with it. In this article we shall take a detailed look at what brings the blessings of Goddess Lakshmi into one’s life. There may be readers here who think that hard work is the key to success. If that were so, the farmers from Africa to China and all countries in between would be wealthy as they toil most. On the contrary, they hardly eke out a living. Some might say that it is intelligence that makes one wealthy. Practical experience however doesn’t support this view. There are highly educated professors in the top notch business schools all over the world and they merely make their salaries. They are financially comfortable but not wealthy. Albert Einstein had an IQ of 167 but he was not a wealthy man. There is a third category of people who combine hard work with intelligence and they are generally more successful. A large number of small businesses, stock market traders and other professionals make large amounts of money. Stupendous wealth however seldom comes their way. Maha Rishi Parashar – the father of Vedic astrology – has given the following pointers to ascertain the degree of wealth in a horoscope. There are twelve houses in a chart and the first, fourth, seventh and tenth houses are called Kendra (central) houses. These, as the name suggests are central to the delineation of a horoscope. The planets ruling over these houses become neutral and may or may not give good results. Their results are based on their ownership of the other house they own. In case either Sun or Moon rule these house, their results too become neutral. The first, the fifth and the ninth house are called Trikon (triangle) houses. These are uniformly beneficial houses and their ruling planets will always give favorable results. The combination of two planets ruling a Kendra and Trikon will always give good results and bestow wealth, status and happiness. The only condition is that they be strong. 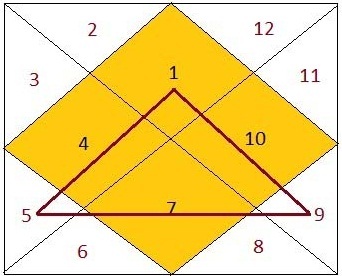 The first house or Lagna (ascendant) is included in Kendra as well as Trikon groups and so becomes a Kendra and a Trikon ruler simultaneously. If strong, he gives excellent results especially in connection to finances. The planets that rule over the second and twelfth houses are neutral and give the results of the other house they own. For example for Aries ascendant, Venus becomes the lord of the second house but gives results pertaining to the other house she owns – the seventh. Similarly Jupiter owns the twelfth and the ninth house but will act as the lord of the ninth house only. If the second and the twelfth houses are owned by Sun or Moon – like Sun for cancer ascendant and Moon for Leo – their results will depend upon the house they are placed in and will be independent of their ownership of the second or the twelfth house. Understanding this is involves some mental gymnastics for the beginner but has deep importance. Planets that rule over third, sixth and eleventh houses give unfavorable results even if they are benefic planets like Jupiter and Venus. The twelfth house from any house causes the decay of the house he is twelfth from. For example, the ascendant represents the body and the twelfth house from it is the house of Moksha (freedom from rebirth). The ninth house symbolizes good fortune and the eighth house which is the twelfth house from it gives poverty. It is for this reason that eighth house is considered a bad house. Application of the above mentioned rules for twelve ascendants gives us the planets which give most favorable results for each ascendant. Here is the list. When these favorable planets for each ascendant associate with each other, they generate wealth. The degree of wealth is dependent upon their strength. The second house represents wealth in a horoscope. The lord of this house therefore symbolizes all things that have value in life. The eleventh house rules over financial gains so the lord of this house also represents valuable things. Now here is something really interesting, for two ascendants Leo and Aquarius the second and fourth houses are ruled by the same planet. For Leo it is Mercury and for Aquarius, Jupiter. It is for this reason that they become extremely important planets for these ascendants. They greatly increase the value of whichever house or house lord they associate with. If they are connected to the ascendant, the person will become very wealthy. If to the fourth house, mother will be wealthy and that person will have valuable house, cars and real estates. He will also be very happy. If these planets influence the seventh house and the seventh lord, the life partner will be a person of value – meaning wealthy and well placed in life. Yog in Sanskrit means addition or combination. When two planets unite their energies, their emerging results are different from their individual effects. This union of planets by conjunction or aspect is called Yog. Yog can be beneficial and prosperity producing in which case it is generally called a Raj Yog. Vipreet Raj Yog is important because it has great potential to bring wealth. If there are other Dhan Yog present, a person can become extremely wealthy. For example if along with a Vipreet Raj Yog there is also a combination of second, ninth and eleventh lords with all three planets strong and placed in second, ninth or eleventh house, the person will command stupendous wealth. All nine planets become powerful in one sign or another. They become powerless in the sign opposite to that. When they are powerful by placement they are called Uchha (On top) or exalted. When they become powerless they are called Neech (fallen) debilitated. For a planet in such a state the results connected to that planet will suffer. For example if the ascendant lord is placed Neech in the horoscope, all traits connected to ascendant will suffer. The health will be bad, self esteem will be low, self confidence will be wanting and generally that person will be unsuccessful. Neech Bhang Raj Yog or Yog formed by cancellation of debilitation. There are certain conditions under which this debilitation is negated. This happens when the lord of the sign where a planet is debilitated is in a Kendra from ascendant or Moon. For example, Sun becomes debilitated in Libra and loses his capacity to give beneficial results. However if lord of Libra Venus is placed in 1, 4, 7, 10 houses from ascendant or Moon, Sun will regain his power to do good. Same thing happens if Venus is exalted in Pisces. This fact needs to be set in stone and kept some where safe. Neech Bhang Raj Yog like Vipreet Raj Yog has tremendous capacity to lift a person from obscurity and put him on top of the heap. When natural benefics like Jupiter, Venus and Mercury occupy the sixth, seventh or eighth house from ascendant, Moon or Sun, Adhi yoga is produced. The placement can be random and is independent of the order of planets. These Adhi Yog too are highly capable of giving high quality wealth. When a planet aspects the house that it rules, he adds great strength to it. For example if the ascendant be Aries and its lord Mars is placed in the seventh house, he will aspect the ascendant and make it very strong. This will give physical strength, and make that person self confident. His self esteem will be high and he will have an aggressive personality. This is an important point and must be kept in sight off. Four or more planets aspecting their respective houses in a horoscope have the capacity to raise a person to great heights of wealth and status. If the planets aspecting their houses are also placed in Kendra to each other, they add even more power to the chart. Yet another boost is given if this happens from birth, Moon and Sun charts. People with such horoscope are rare and bring hugely good Karma from past lives. No wonder they end up being extremely wealthy and powerful. When any or more of the Ascendant, second, and ninth lords are exalted, and the planet of their exaltation sign is also exalted and placed happily in a chart, great wealth results. For example, for Libra ascendant, if Mars is exalted in the fourth house, and the lord of the fourth house Saturn is placed in Libra, great wealth will result. Ketu is a Shadowy planet and gives the results of the house he is placed in or the planet he is associated with. Ketu has the unique capacity to exponentially increase the power of the planet with whom he is placed. For example, for Virgo ascendant, Venus placed in the second house with Ketu will give excellent results. Venus occupies his own house so the house of wealth becomes strong, a further measure of strength is given by Ketu’s association with Venus. Benefic planets occupying Kendra houses and sixth and eighth houses constitute this yoga. If no planets occupy the sixth and eighth house, and benefics occupy Kendra houses then too this Yog is formed. Ascendant and twelfth lord placed in Kendra houses (1,4,7,10) houses from each other also make this Yog. If the lord of the house where ascendant lord is placed is exalted or in his own house and is placed in a Kendra or Trikon house, this Yog is formed. As the name suggests, this makes a person strong, high and exalted and brings in much wealth. If due to reasons connected to past life karma, one is confronted with precarious finances, the following chants will remove the problem from the root. Some more famous Stotra are given below. May we all enjoy health and freedom from disease. May we all have prosperity and good luck. May none suffer or fall on evil days. How did you like this article? Please leave your comments and Blog topics for future. Having problems getting children? Here is how Jyotish tackles this problem. 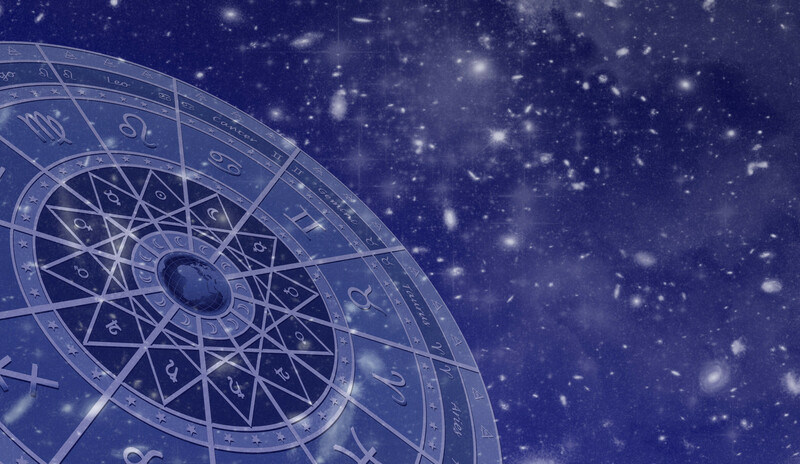 Hindu Vedic Astro is your perfect platform for yearly and monthly horoscopes. All services like astrology readings, astrology compatibility and astrology reports for all zodiac signs are just a phone call away. Your detailed birth chart is sent absolutely free with every report. Call right now for step by step, simple and easy remedies that work quickly to put your life back on track. This article is copyrighted 2016. It cannot be used in part or as a whole without the written permission of the author Rajiv Sethi. Infringement will be prosecuted to the full extent of the law. Perfect Platform for Your Health, Money, Career, Business Obstacle, Match Making & Family Prediction. Book your Appointment to get Personalised hygroscopic prediction today.